The Florida Audio Expo taking place this weekend in Tampa will be covered by Yours Truly and our trusty professional photographer/team orthodontist. Keep an eye out for upcoming coverage! About 18 months ago, I had the privilege of covering an article for PTA about a Roon neophyte’s experience both with the 1.2 upgrade as well as various options for inexpensive Roon endpoints. During the writing, not only did I learn a great deal about the hardware endpoints that allow Roon to multi-room stream like no other, I was also happy to delve into the tools that Roon provides, like the best NAS and remote storage integration and cataloging system in the business. The user interface, even back then, was very slick, involving, and a pleasure to visualize. Frankly, Roon has been an absolute epiphany for me and my progressive satisfaction with its performance would be gargantuan shoes to fill. What can I say? I’ve morphed into a Roon junkie. It started with the super-intuitive interface (dark or light theme: come to the Dark Side) and continued with the silky-smooth integration between Tidal albums and hard copy files that I had populated from the post-apocalyptic disaster that was my digital file organization. During the 1.2 release, I was thrilled with the ability to lossless/wireless stream to various endpoints in an ever-expanding licensing agreement frenzy with many of the digital streamer/DAC companies you already know and love. Sure, I got giddy on following the signal path and seeing “lossless” light up when the system was firing on all cylinders. Additionally, the metadata functions have greatly improved, combining albums and making compilations much easier to see, without duplicating thumbnails. Now, since I’m a Roon lemming, the updates to the signal path button have been addictive to me. 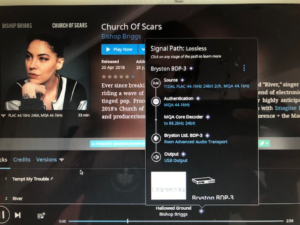 For MQA files such as “Church of Scars” by Bishop Briggs, will not only show you in ad infinitum detail the signal train from NAS to monitors, but now also has a few more interactive components, like being able to adjust the DAC’s settings from the signal path window. DSP and headroom adjustment are right at your fingertips, and way easier to find in the new software update. But for me, the piece de resistance was the introduction of Tidal and subsequent nascent MQA support via Tidal Masters. The beginnings of Tidal Masters MQA streaming and its seamless integration with Roon meant that I happily ditched iTunes and Audirvana like a jilted prom date and never looked back. I’ve loved Tidal so far, but I still have a Spotify Premium subscription, which by the numbers is way more popular for the non-audiophile crowd. Additionally, Roon still does not support native Qobuz playback. Hopefully that will change soon as the Paris-based hi-res streaming company recently hired a new US CEO, former Warner Music France exec Yann Miossec; the company has made it known that US expansion should happen sometime this year, and it would of course behoove both companies to seriously consider an agreement. Fast forward to May 2nd, when the execs at Roon made a press release about the impending release of the version 1.5 software update. There are some cool streamlining tasks they undertook since their last release as well as a much-expanded Tidal Masters catalog, but the big buzz was native MQA support, i.e. the initial unfolding of MQA’s contortionist Origami structure. I was tickled pink to see this, not necessarily because I believe that MQA is “The Answer,” but I do believe a new format that is inherently stream-friendly shows forward thinking and at least anticipating the changes that the audiophile community may experience over the next five years or so. 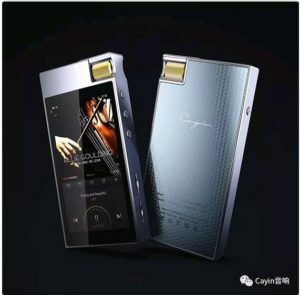 I’m not pro- or anti-MQA, I’m just glad that Roon is giving them a chance to prove that hi-res hard copies and high-quality streaming can exist hand in hand for the betterment of the whole industry. This is without comment on whether the MQA technology is measurably better in terms of sound quality or a DRM roadblock; at this point I’m just glad there’s a great high-quality streaming capability that easily makes more sense than many hi-res hard copy downloads including the never-to-be-mainstreamed DSD. 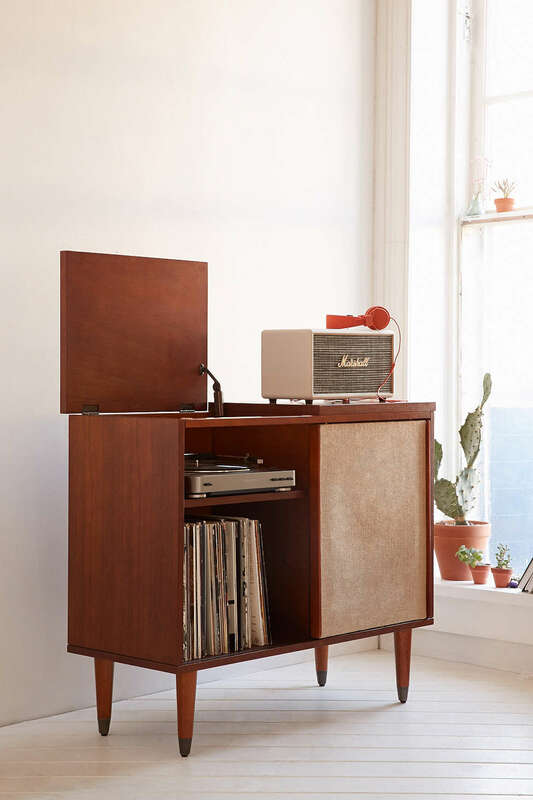 These days, while the broad music industry and consumer relies primarily on convenience (sound bar, easy Bluetooth streaming), the burgeoning millennial audiophile wants both convenience and quality, and Roon/Tidal fit that bill precisely. And almost as an ampersand, tucked away in the press releases over eight weeks from the release of 1.5, came the announcement that Google Chromecast is now a Roon endpoint. For the cost-conscious among us or those not hyper-focused on hi-res number spouting, a $35 outlay for a dependable Wi-Fi endpoint is a virtual game-changer. No more endless nights attempting to teach yourself Linux to build a Linux-based Raspberry Pi just to get a sub-hundred dollar Roon endpoint. I’m not going to get into the various unfoldings of MQA from the software to the hardware, because honestly they could be explaining how to dismantle a nuclear device and I would not be able to follow along. Suffice it to say, I like what I hear with MQA and am rooting for the company to succeed in its endeavors, primarily because I think a high-quality streaming option on Tidal will appeal to a growing crowd of younger audiophiles who 1) want high quality but 2) are too ambivalent to actually pay or download but could impulse hit “add to library” on the Roon/Tidal interface. I do believe that Tidal’s continued courting of companies like Roon can only be a good thing. 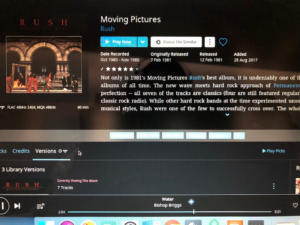 Whether you have a hard copy MQA album or have added it to your library via Tidal integration, the Roon user is now able to compare various recordings quite easily under the “versions” tab. It’s much more intuitive in 1.5 than in 1.2, and certainly faster. Don’t ask me to double-blind myself and expect to get greater than Rosencrantz/Guildenstern coin-flip accuracy, but the option is there, and if your streamer and DAC further unfold the MQA file then perhaps you may hear a difference. This feature is what Roon bragged about from the beginning with their ad “Compare Horowitz, Rubinstein, Brendel, and all 284 other performances of the Moonlight Sonata.” Frankly, until 1.5 I had no idea how to do this, and since they’ve highlighted the button it is way more intuitive to show your three versions of the same album, be they HDtracks download, CD upload, or Tidal MQA. This is a great feature that I’ve been waiting for Roon to make more user-friendly. Roon’s recent press release went into some detail about its improvement in metadata organization. I personally have seen previously disjointed albums that had auto-corrected and ended up under one icon, with the correct album cover, and no more splitting up box sets or compilations. The metadata revamp is a HUGE improvement over the previous 1.2/1.4, and makes for a much more enjoyable user experience. Now, the new radio function is a lot more seamless and intelligent than the previous iteration, which is convenient when you’re knee-deep in toddlers and house guests. But what -really- intrigues me is the hint of a “mobile capable version” suggesting impending iOS support. 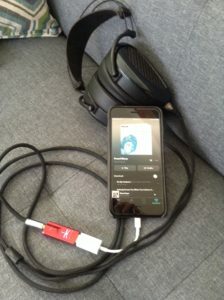 Android devices can already act as a Roon endpoint, but if Apple was on the bandwagon that would mean we could attach the AudioQuest Dragonfly to an iPhone and enjoy MQA unfolding from Roon all the way through the DAC to the headphones. Frankly, I’m miffed that Apple hasn’t rectified this sooner, but I’ll take what I can get. All supposition, of course. 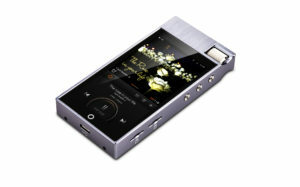 Conveniently, Roon also announced in their press release was that they are now supporting Linn DS products as endpoints. While Linn is actively working on the firmware patch to complete the process, expect this to be quickly forthcoming. While I haven’t spent too much time with the Linn products, those of you who are disciples will no doubt be thrilled with the prospect. There are two other rather important developments to mention about the Roon 1.5 update. The Roonies (like Goonies, except without Rocky Road) have been working diligently with Wyred 4 Sound to develop the Roon Nucleus and Nucleus +, which are Roon’s first foray into hardware powered by their Linux-based OS specifically designed for Roon. The Nucleus can run the Roon Core, and one can attach external hard drives, NAS hardware, and the network via either a Wi-Fi router or a hardwire cat6 Ethernet plug. I’m currently running Roon Core on my MacBook Air and the files are stored on a Synology NAS, but when the collection cracks several thousand albums it starts to get twitchy; a truly deflating experience if one is trying to get gapless playback. I suspect a dedicated CPU with direct USB or Ethernet connections to the NAS or external drive with Roon’s optimized OS will be a great solution for those whose media has revolted and gone off the reservation. I personally have had some issues with cutouts and in investigating with the RoonLabs community forum experts, it seems that less Wi-Fi jumps made in the system will reduce the likelihood of intermittent cutouts. My albums are all on a Synology NAS right now, with the Roon Core on my Macbook Air. Scanning a full 4TB NAS can cause Mac Meltdown. A Roon Nucleus is looming for me in the very near future to see whether this hardware addition will smooth out any bumps in the road for playback. 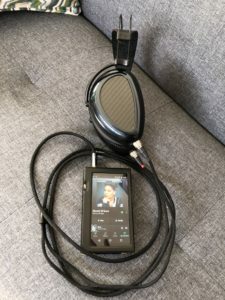 Onkyo DP-X1 DAP, android-based and functioning as a Roon endpoint, with native MQA rendering, alternating between a pair of Oppo PM-3s and MrSpeakers Ether Flow open back planar magnetics. MacBook Air as Roon Core, with AudioQuest Dragonfly Red, to aforementioned headphones. 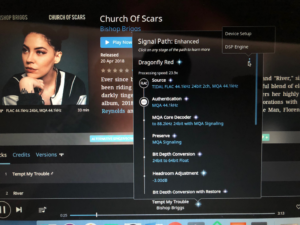 Roon/Tidal MQA Masters through the Dragonfly Red with MQA firmware update is about as good as it gets from a head-fi standpoint. As mentioned before, Bishop Brigg’s debut album “Church of Scars” is as dynamic and enveloping as Lorde’s debut was four years ago. Jason Aldean’s new release “Rearview Town” is as well recorded and rendered as any modern country album I’ve heard in the past few years. 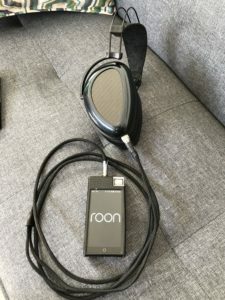 Roon have set the bar very high for hi-res software, and I am very much looking forward to what they have in store for the future, especially in the streaming, mobile and MQA department. The high points for me are the addition of native MQA support, the vast improvement in metadata management, and the much easier method of comparing different files. The minimal low points are no support for Spotify or other streaming services (hopefully Qobuz on the horizon) and the straining of playback when the library gets uber-huge. Color me no longer a Roon neophyte, but a firm acolyte. Also, note this signal path is described as “lossless” even while using MQA, which is technically not lossless. This has to do with alterations in the DSP engine, nothing more. Note the “versions” tab in the lower left hand column, which is much more intuitive than before. 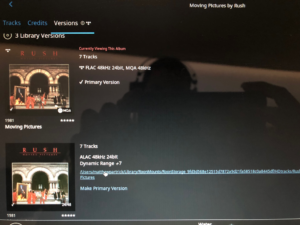 The subsequent screen when one clicks “versions.” Note that the top Rush album is MQA. 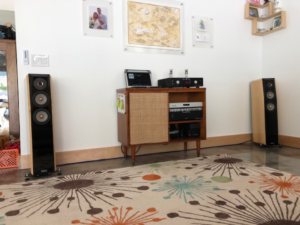 I have the ongoing pleasure of writing for Mr. Stone, and this is my latest installment about value propositions in the audiophile and guitar market.